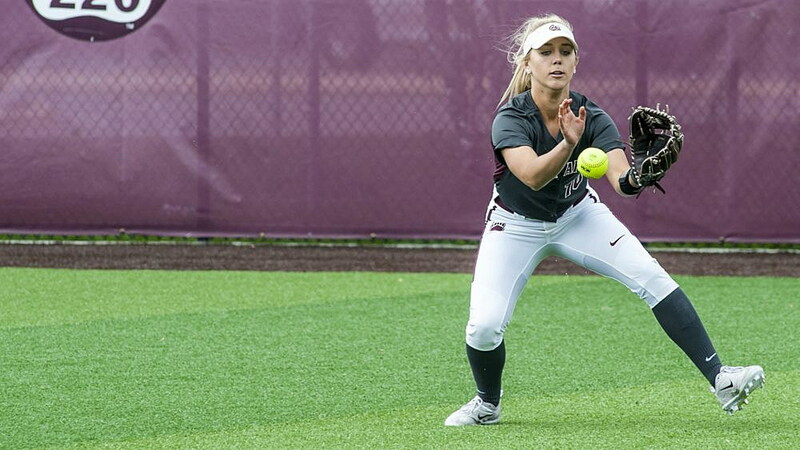 The Montana softball team, already a top-two seed at next week’s Big Sky Conference tournament, will close out the regular season this week with a three-game series at league leader Weber State. The Grizzlies (30-21, 13-5 BSC) and Wildcats (30-15-1, 14-3 BSC) will play a doubleheader on Friday starting at 2 p.m., with a single game on Saturday beginning at noon. Coverage: Free video coverage of the series will be available through Eversport.tv, with Weber State also offering live stats. Links to those services can be found at gogriz.com. Where they stand: Weber State and Montana have slowly been separating themselves from the rest of the teams in the Big Sky throughout the course of the season. The Grizzlies are the only team in the league that has won each of its first six series. The Wildcats split a rain-shortened two-game series at Sacramento State to open their Big Sky schedule and lost two of three at Northern Colorado, but WSU also has four series sweeps to Montana’s one. That has put them at first and second place in the Big Sky, four games clear of the closest pursuer. What’s at stake: Not much, just the regular-season championship and hosting rights to next week’s six-team tournament, which will be held Thursday through Saturday. Montana needs a three-game sweep to pull it off. Just one win this week gives it all to Weber State for the second straight season. In a mirror scenario of last year at this time, Montana will face Weber State on the final weekend with a chance to play for a Big Sky championship. Of course there are some differences. That series, in which Montana won the first two games before dropping the all-or-nothing finale, was played at Grizzly Softball Field. And Montana needed some outside help, which it got from Portland State. “Last year we got on a hot streak and woke up on the final day and were playing for it,” says coach Jamie Pinkerton. “For lack of a better term, we kind of stumbled into it. Montana has been the Big Sky’s most consistent team all season, winning six straight series, but no team is hotter than Weber State, which has won its last nine league games, three in five innings. And then there is the added challenge of facing the Wildcats on their home field in Ogden, where they are 35-4 since the start of the 2015 season. Weber State is 9-0 in home Big Sky games this season. The run differential in those games: 69-18. “You could sit back and think, woe is us, we’ve got this big mountain to climb,” said Pinkerton. “But I also know there are six other teams who would love to be in our position right now. Not surprisingly, Montana (3.17) and Weber State (3.30) have the Big Sky’s top two ERAs and both are sound defensively. What sticks out is offense. Playing the same six league opponents as Montana the last six weeks, Weber State has batted .350, with 103 runs scored. Even with the benefit of playing one more game, the Grizzlies are batting .284 in league and have scored 71 runs. The Wildcats have a high-average leadoff hitter — right fielder Takesha Saltern is batting a league-best .451 — and a productive run producer in the three spot. First baseman Sara Hingsberger was named the USA Softball National Player of the Week for the damage she inflicted on Southern Utah last weekend in a three-game sweep in Ogden. She hit .700 against the Thunderbirds, with five runs scored and three RBIs. The hope for Montana is that the Grizzlies either hold that offense in check — and with the Big Sky’s best ERA and statistical defense, that’s a possibility — or they find some hot bats. Montana won its most recent series, against Idaho State, by scoring 10 runs in three games. In winning two of three at Portland State, the Grizzlies scored seven runs. In going 2-1 at Sacramento State, Montana scored nine runs. “We’ve been winning series by scoring 10 runs or fewer, and on one side that tickles me to death,” says Pinkerton. “So we’ve shown we can play that type of series, but we’re going to have to try to find a way to score runs. In Bethany Olea (.412) and Delene Colburn (.397), Montana has two of the top four leaders in the Big Sky in batting average, and the Grizzlies lead the league in walks, so the runners have been on base. The problem has been driving them in. Montana is batting .273 in league with runners in scoring position and is just 4 for 26 with the bases loaded, and the Grizzlies are averaging fewer than four runs per game. There is good reason 12 of Montana’s 18 Big Sky games have been decided by two runs or fewer. “One of the things we need to do to turn things into our favor is when we get runners in scoring position, we’ve got to start coming through,” said Pinkerton. “We can’t go 1 for 12 or 2 for 15 and win. With Weber State winning the last two Big Sky tournament titles under coach Mary Kay Amicone and Montana showing it is laying the foundation to be a consistent contender, Grizzlies-Wildcats is turning into the top Big Sky softball rivalry. “It’s become a good rivalry, and so far it’s been a clean and classy rivalry,” said Pinkerton. “I think any team likes to play another good team. * Montana has gone 2-5 against Weber State. The Grizzlies traveled to Ogden in season No. 1 and got swept and outscored 19-1. Last season Montana swept the series-opening doubleheader before dropping the finale 9-7. The Wildcats also defeated the Griz at the Big Sky tournament in Ogden, 10-2. * Whether next week’s double-elimination tournament is in Ogden or Missoula, it will open with four games on Thursday, followed by four more on Friday, with either two or three on Saturday. One of the top two seeds could win the tournament, as Weber State did last spring, with just three victories. A team seeded third through sixth that loses early could have to play seven games to win the championship as it makes its way through the losers’ bracket. * The All-Big Sky Conference teams and individual awards will be announced next Wednesday, the day before the tournament opens. The MVP will likely be decided by which team comes out on top this week in Ogden. * Montana now has three of the top eight pitchers in the Big Sky statistics in ERA. Michaela Hood (2.10) is second behind North Dakota’s Kaylin VanDomelen (1.86), while Colleen Driscoll (3.22) and Maddy Stensby (3.28) rank seventh and eighth. * Hood is going to blow away some of the early single-season pitching records that have been established the last two years. The program record for ERA is 4.29, set by Kenzie Cole in 2015. Cole also set the strikeout record of 98 in 2015. Hood already has 149. * Weber State’s Kirtlyn Bohling ranks third in the Big Sky in ERA at 2.33 and gets used in much the same way Pinkerton uses Hood. Bohling will start Friday’s opener, then likely pitch again on Saturday, depending on what is still at stake. Sometimes it’s a game three start, sometimes it’s relief. * Montana has gone 22-7 since March 12, when Driscoll and Stensby held down Wichita State in a 3-1 win on the final day of Tulsa’s tournament. Last season the Grizzlies ended the regular season winning 14 of their last 16. * If Montana does not host the tournament, the Grizzlies will finish the season with a 17-5 home record. Montana went 11-5 at Grizzly Softball Field in 2015, 12-6 last season for three-year record of 40-16.